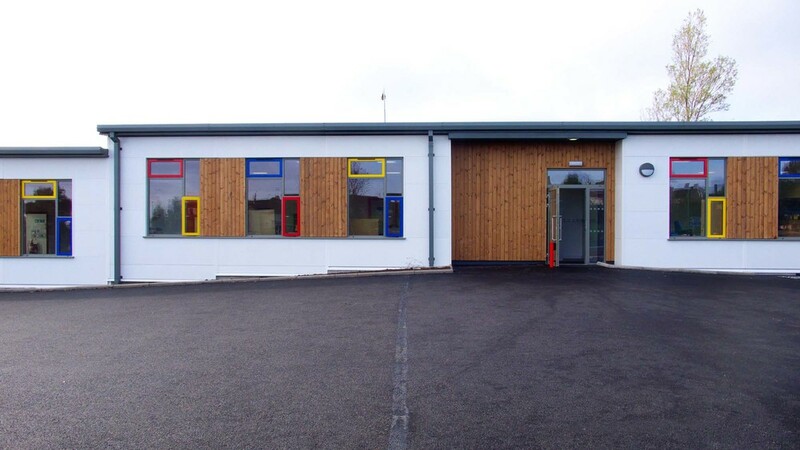 This scheme comprises Phase 1 of three at Gaelscoil na Móna to enable the school to expand incrementally without disrupting the existing facility. The overall school will include five classrooms, an assembly hall, staff, office and ancillary accommodation. The site is between the Monagh By-pass, a noisy dual carriageway and Monagh Link, a somewhat quieter residential community. Immediate site constraints included the change in level across the site and the impact of traffic noise. The accommodation is arranged on two levels, with all of the classrooms on top, i.e. level with the playground. 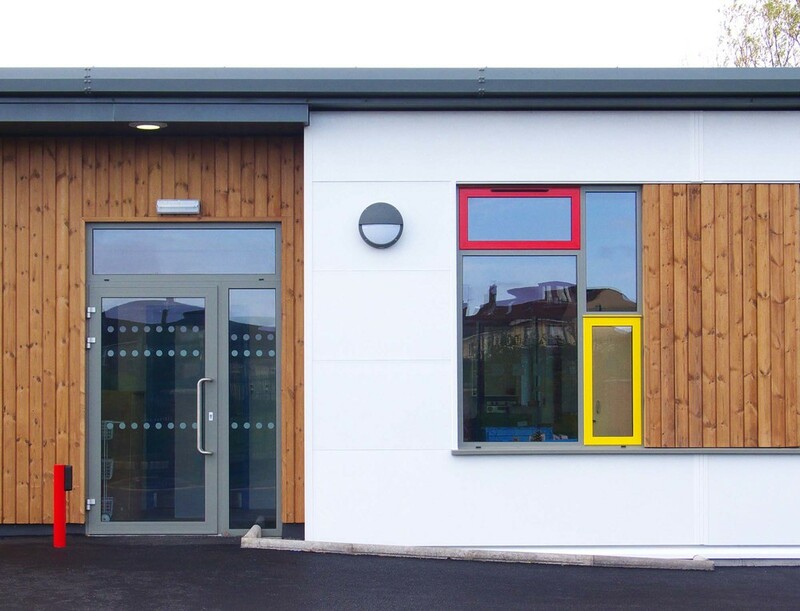 This first phase comprises three of the five classrooms and ancillary facilities within a single storey block which acts as a buffer from the carriageway, with a playground enclosure addressing the residential community opposite. Classes are fenestrated towards the playground and are further protected from traffic noise by a corridor running along the boundary with the bypass; resource areas open on to this circulation. 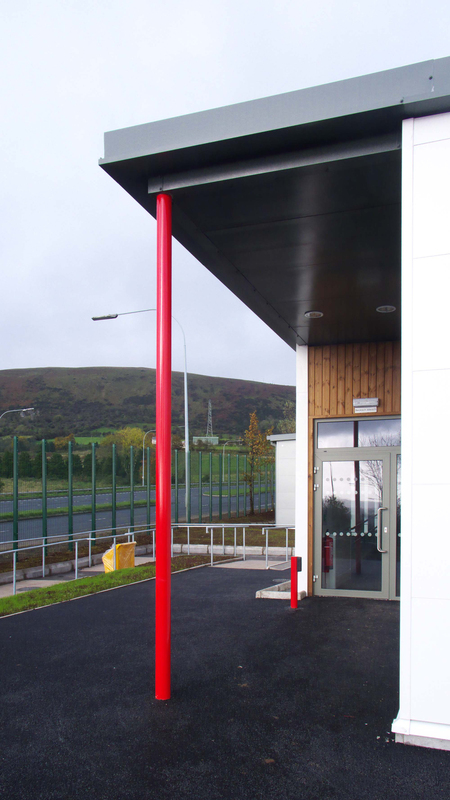 The existing accommodation was all in the form of traditional temporary mobile classrooms, with a short term life expectancy due to low cost, rapid construction and ‘transportability’ to other locations. However changing legislation driven by the climate change agenda meant that construction costs of new mobiles are comparable to permanent new-build. Our objective was to improve the quality to a 30-year minimum life span in order to justify the costs, whilst still benefiting from the speed of construction and mobility. To this end, choice of materials and the grouping of openings vary significantly.